+ Still loving all of the mules these seasons, my newest faves I have been eyeing! + I am finally getting around to making some plans for my trip to Highpoint Market in October. In case you didn't know I offer sourcing only services. Send me an email to get on my list for this year's trip! + I am not sure what has happened to me but I am pretty excited for October 1 when it is appropriate to put up our new bats on the front door and hang our friendly ghost from the front porch. I am going to blame it on the excitement that it will bring my girls! + I have been following (and trying to snag) one of Kayce Hughes pieces for a while now. While she does have pieces for sale online I love following her Instagram and thinking of the day I will type "sold" fast enough! How is it possibly September 1? Does anyone else feel like life flies by as an adult? When school was just starting back as a kid Christmas felt like an eternity away, as an adult it feels like its next week! There are lots of fun projects going on around here, I cant wait to keep sharing along the way! +I try to update this section of my website at least weekly, check in on the things that are catching my eye! +I sourced this floor lamp in an office design recently and still find myself thinking about it. I love the interesting shape and color, it would be great in a dark moody space or neutral space. I want it in my house! +I am all about the slide this season, I love these black loafer slides from free people, and these soludos. +Looking for great "boho-ish" pillows, check out Danielle Oakey. +Everlane is launching denim next week, anyone else excited to try. I love almost everything they do! I feel like every time I get back on here to post a blog I say something to the tune of, "I am going to be better at popping in and sharing more on the blog." And alas, here I am for only the 2nd time this summer. But, I do really want to bring back my weekly "to share" post. It will be everything from projects, family, fashion and food. They have always been my favorite posts to put together so I am just going to make it happen. Hopefully you follow along on instagram where I share more often about work finds and projects and stories of my girls. + My go to stock drapery for window treatments? These from pottery barn! The quality and weight is amazing. When in doubt get lined, it will give them more substance. Other drapery quick tips: hang from rings, white linen almost always works and of course hang high and wide! + Have you checked out Jenny Komenda's print shop. What a fun budget friendly way to add some art around your home. Also, follow her on instagram she always has great projects going on! + My trip to Winter Park, FL with the girls was a success (and made mama oh, so tired!). Its a great spot to visit, close enough to disney that you have that as an option but is a quieter spot with beautiful home, great restaurants, lakes and good shopping! If you find yourself there I recommend... SHOPPING: Violet Clover, Restoration Hardware and Canvas Interiors. EATING: Ravenous Pig, Dexters and The Briar Patch. + We are a couple weeks away from getting two projects photographed! It has been killing me to refrain from too many sneak peeks, I am very excited to share the projects with you. + DECOR AND KITCHEN is on sale at one of my favorite spots Mcgee and Co. Stock up! I am really going to start trying to blog more around here, peeks of projects and reference guides to what I am sourcing and discovering. The above cement tile picks range in price and manufacturer, bookmark it for reference on your next project! A quick update on my most used paint colors for projects so far in 2017! I am such a neutral paint person at heart. But, I can always be talked into moody neutrals for depth. Painting interior doors something other than white is one of my favorite tricks to making a space or home feel unique, unexpected and thought out. And of course, I am loving the revival of green in the decor and fashion world! Nothing like a great before and after. This space went from terrible chandelier, red paint and wood grain trim to eider white, drum fixture and black windows! Here are some pictures, one day we will get a professional in here that can do a much better job than I can at interior photos! Santa is bring a teepee for the other corner, and then everything will be just about done in here til we replace the flooring to match the rest of the house. + I am in the final stages with one of my local clients here in Charleston. Their house is amazing and I cant wait to see it all installed and styled! We put this rug in the guest bath on marble basket weave tile! + Since I don't post on here regularly I am trying to post on instagram 4-5 times a week, follow along! + Any clients who signs up for design services between now and 11/15/16 gets a free antique yastik oushak rug, email for details or any questions! + I just snagged this top and this skirt from madewell, guess I won't be straying far from my "mainly black" wardrobe this fall. + In between my own house projects and client jobs I have been trying to clean up my pinterest and keep my "picks" section up to date. Its still a work in progress, but make sure you are following along! + Need new hardware? Hex pulls for under $5...go now! This new house needs a lot of rugs! They will play an important role in helping with noise as well as adding texture and color to our project #paintitwhite! I am planning on trying to have a mixture of vintage rugs and affordable large area rugs. I have searched through hundreds and hundreds of rugs and thought I would share some of my favorite finds. + This week on our fixer upper: ceilings finished, upstairs painted, trim painted and they are almost done with my kitchen cabinets! Follow along @violaandroy and on snapchat @beccsjones, I will start with some finishes and furnishings this week! 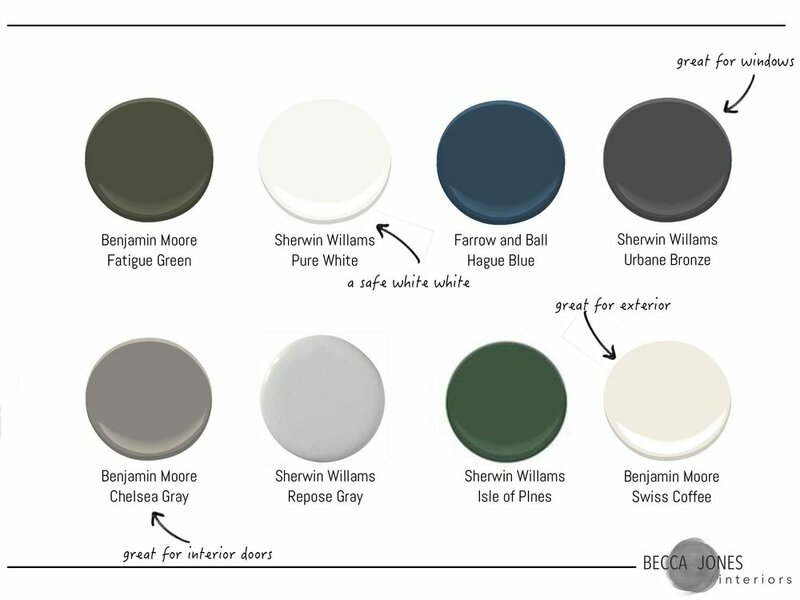 + So far paint colors that are finalized for interior: SW snowbound, BM kendall charcoal (lower cabinets), BM chelsea gray (interior doors), SW pure white and SW eider white (a change from BM classic gray). + If you are not tuning into Studio McGee's webisodes (they also launched their online shop today mcgee and co) you are missing out! She is one of my faves. + Just in case you are looking for new instagram and snapchat accounts to follow, three of my favorites: studio mcgee, liz adams and jennas kitchen. + I have been doing a lot of rug and lighting sourcing: this striped one from lulu and georgia and this flushmount for our low ceiling play room. 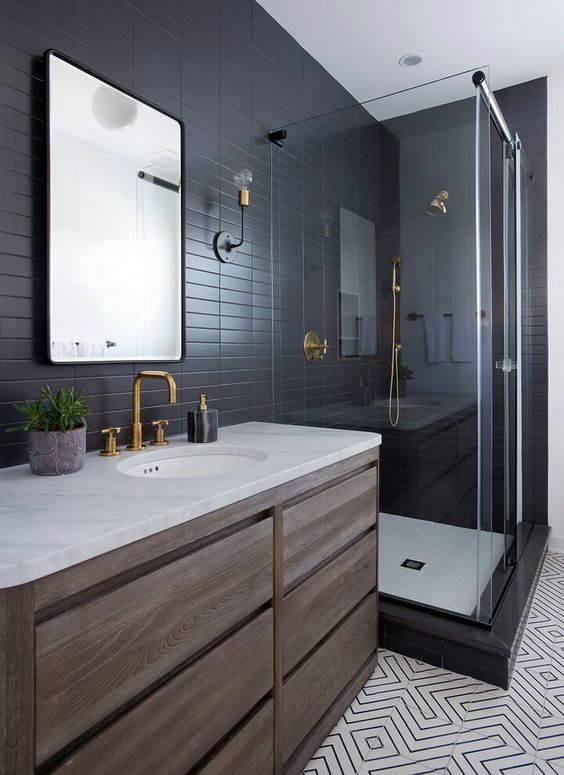 + This has me thinking that patterned tile will make an appearance somewhere in the house, maybe the girls bath! + This nervous Olympic mama cracks me up, probably because I see myself in her already! I was so ready to get rid of the "want to be red but really your pink" front door at our new house. It was such a strange color combination that made me think of ketchup and mustard every time I saw it. We have "longer" term plans to re-side the house and choose a new exterior color during that process. But, until then I need to make the current color work. Thanks to a little photoshop I realized that getting rid of the red mulch and red door makes the house look more tan and less gold. We had contractors at the house this week painting trim, the LR and starting some kitchen reno so while that was happening I had to get to work on that front door. Oh, the difference it makes! Color is Valspar's Lincoln Cottage Black, I am also including some front door accessories we have ordered/plan on adding. ....and a little photoshop peek of what we are going for with the addition of shutters and some climbing vines. Here is the order to paint your front door, it makes a big difference (panes, horizontal lines, then vertical lines)! Our family has enjoyed a home on Edisto Island for almost 25 years now. The rooms were beginning to look a bit dated, so I was tasked with giving them a face lift. I threw together very basic graphics for a starting point. It has been fun to watch the transformation, real pictures to come. Top left (master) Wall Color Sherwin Williams Peppercorn, Rug One Kings Lane, Velvet Pillows Furbish, Lumbar, Kantha Celadon, pine furniture, club chairs. + I am loving everything I have tried from Glossier so far, their boy brow and skin tint are amazing! + Charleston always has amazing artists and small businesses to brag on, but lately the beautiful skirts from francis and benedict have had my attention, they are releasing a new line soon! + Madewell is having an april fools sale! My favorites: this black tee basic, this bracelet, this button up, this popular top was just restocked on shopbop. + Pre-order NEEDTOBREATHE's new album and get two singles today. Yall, it is good. + I love the idea of a two minute rule, often two minutes is all I have. I think this would be a great rule to help get things done through out the day! + this weekend we are working on getting emi's big girl room set up, until we move that just consists of a new bed, but she is excited about her new flamingo sheets! + I like this quick plank workout. + I have been a long time fan of the broken stripe rug, this one by esale rugs is good looking and an unbeatable price! + have you checked out the the new "who what wear" line at target? there are some cute things! + spring shopping for the girls, I love billie blooms and this artisan collection from zara! I am the sneaker trend's biggest fan. They are perfect for this season of life where days are filled with playgrounds, errands and taking care of my girls. I am starting to build quite the collection with my favorites being my classic white converse and my vintage nikes, my next purchase is slip on grey vans! - February 1 starts a round of Whole30 with some of my girl friends. Wish us luck! I will be posting some of my favorite meals, tricks and shopping lists over the next thirty days. - I love finding great people to follow on pinterest (especially while nursing!) Emily Lott has been my newest find! - Although I may not be totally consistent in blogging, I am pretty good at keeping my little list of curated picks up to date! - Madewell's new spring arrivals are so fun! I especially love this and this. - This (Le Specs) sunglass line is the perfect price point! I think the flat top and the bandwagon are my favorites. - Christina Applegate's kitchen makeover - its good! - I love getting to live in Charleston: this video and this best of! Popping in to share some of the things that get the most everyday use around here. These days I am all about finding what works as I adjust to life with a two year old and newborn; convenience and dependability are the name of the game! So, I am going for it. I have a pretty good idea what it will look like, but give me a few weeks (c'mon people there is a 7 week old in my house lets not get too ambitious!) to iron out the details. Until then, I hope to be popping in more regularly. And, I will leave you with a pretty little round up of things that have been catching my eye lately. Happy 2016!